Beauty supplements – vitamins and minerals that improve the look and feel of your skin and hair – are everywhere now. I’ve featured several of them before, but I wanted to share with you two new discoveries that I am currently taking. Why do we take supplements? There are so many vitamins and minerals that benefit our bodies in different ways. Some of these we get from eating certain foods, e.g. spinach for Iron; but a lot of them can’t be found in our typical diets. Some of us also require a higher strength of a certain vitamin or mineral (based on personal health reasons) than we can get from eating foods that contain it or even from a taking a multivitamin tablet – e.g. Vitamin C for boosting our immune systems. It is important to be careful not to take too much of certain vitamins and minerals, as this can be bad for you – in particular Iron – so you should always consult a medical professional if you’re not sure what to take and how much. Everyone is different, and I can only share my suggestions. These capsules contain Sea Kelp, which is a type of seaweed. Not many of our Western diets contain much, if any, of this, so it would need to be taken in tablet form. Kelp has nourishing properties and is packed full of vitamins and minerals. If you aren’t keen on taking tablets, these are capsules, so you can also open them up and add the contents to food or drinks. These have physical health benefits related to thyroid function, but they are also beneficial to your hair and skin. Kelp is great for those with dry and dehydrated skin as it helps you skin to retain moisturise and it softens the skin. It also contains antioxidants to help protect your skin from daily environmental stresses. Kelp also has high iodine content, which is thought to combat free radicals. When it comes to hair, Kelp is considered to be able to boost hair growth. It also contains a lot of nutrients and minerals that boost the strength and condition of your hair, which is great if your hair is prown to breakages. These tablets (which smell amazing – like vanilla sponge) are designed to boost your skin’s hydration at a cellular level. This will make your skin look and feel plumper, firmer, younger and glowing; via the tablets hydrating your skin from the inside out. 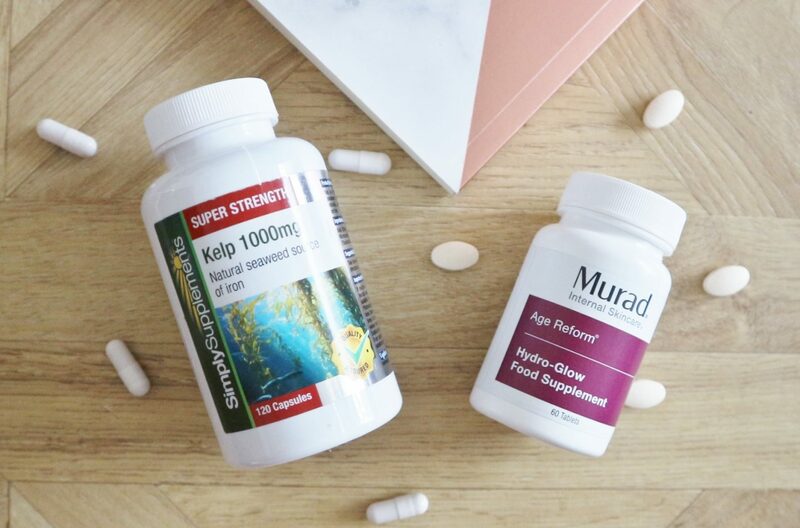 The key ingredient in these tablets is Glucosamine – this is found naturally in our bodies and it creates moisture in cells, plus, it acts as a building block for Collagen and Hyaluronic Acid production. These tablets are designed to hydrate your skin (key for anti-ageing) at a deeper level – a level that topical hydrating treatments find it harder to reach. Collagen is like scaffolding for our skin – it’s what helps it keep its firmness and elasticity. Hyaluronic Acid is also found naturally in our skin, but if we can boost it, all the better – it attracts moisture to our skin and helps keep it there, giving us a plump and youthful complexion. Have you tried either of these products? I am not a medical professional, so please consult your doctor before taking any supplements; especially if you are already on prescribed medication, as there can be some interactions between ingredients. Are there any supplements that you would recommend that have made a difference to you?